The use of magnification to perform various procedures in medical and dental field, particularly endodontics has long been recognized. Unfortunately, its application in periodontics is not widely popularized. The objective of this article is to emphasize the application of microsurgical principles in various periodontal surgical procedures and to reinforce the incorporation of microscope into periodontal practice. The most recent periodontal journals were reviewed and a search of databases such as PubMed or Medline and Google Scholar was conducted for relevant material from published literature up to 2017. Medical Subject Headings words looked for were “periodontal microsurgery” and “minimally invasive periodontal surgery.” The available literature, specifically to periodontal surgical procedures was analyzed and compiled. 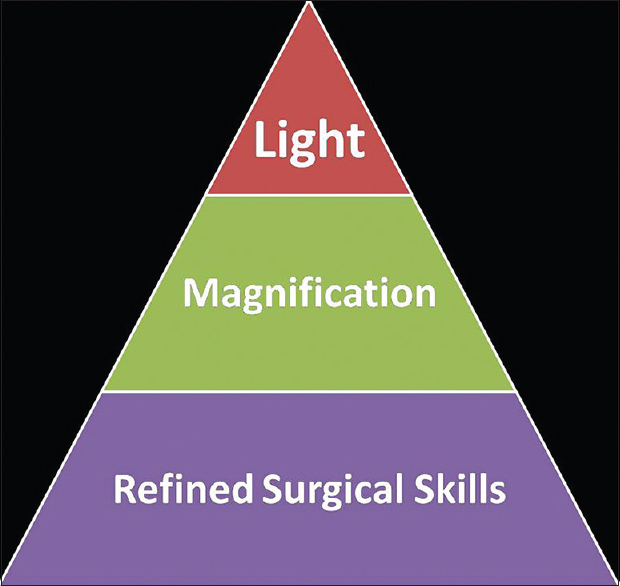 The analysis indicates that incorporation of magnification in periodontal practice is associated with improved visual acuity, ergonomic benefits, decreased patient morbidity, rapid healing, and enhanced patient acceptance. Background: Protease-activated receptors (PAR-1 and PAR-2) are found to be immensely exhibited in the periodontal tissues. These receptors are involved in the inflammatory and repair processes. Activation of PARs is mainly by the bacterial and endogenous enzymes. The aim of the study was to determine the role of PAR-1 and PAR-2 in initiating periodontal inflammation and to immunolocalize these receptors in the gingival tissues of healthy and chronic periodontitis individuals. Materials and Methods: A total of 50 patients were selected for this study, of which 25 were healthy controls and 25 were chronic periodontitis patients. Gingival tissues were excised from the marginal gingiva and interdental papilla under local anesthesia (xylocaine with 2% adrenaline) during crown lengthening procedure or during periodontal therapy depending on the respective groups. Immunohistochemical analyses of PARs were done by staining the samples with hematoxylin and eosin and with primary and secondary antibody for PAR-1 and PAR-2. Results: The Hematoxylin and Eosin staining showed more inflammatory changes in the periodontitis group compared to healthy gingiva. In chronic periodontitis, PAR-1-positive cells were seen in the basal layer with a weak expression and were showing negative expression in the superficial layer. In consideration of PAR-2, there was a very strong expression up to the superficial layer of the epithelium, compared to PAR-1. On comparing the intensity of staining in the connective tissue of chronic periodontitis sample, there was an increased expression of PAR-2 compared with PAR-1. 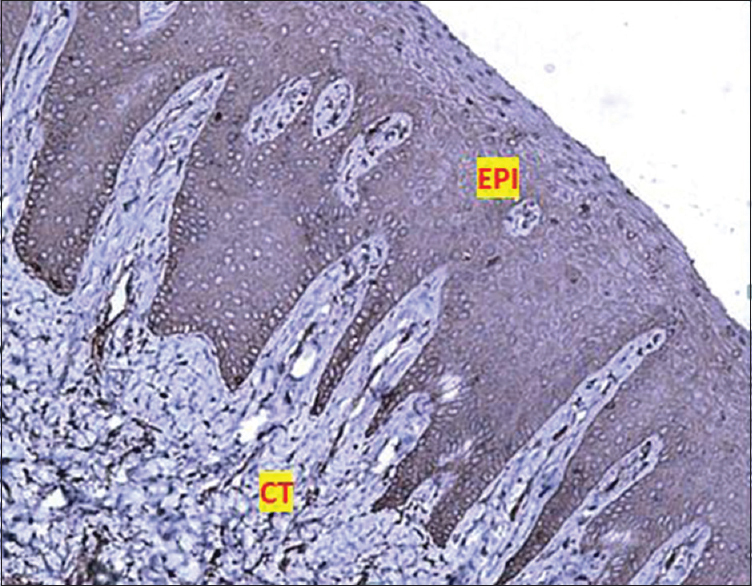 A low positive expression of PAR-1 and PAR-2 was observed in the epithelium and connective tissue of the healthy tissues. Conclusion: The results clearly demonstrated the role of PAR-1 and 2 in periodontal inflammation. Background: Tooth polishing is an integral part of clinical dentistry. The main purpose of polishing is to smoothen the surface of the tooth and minimize the deposition of plaque to allow a healthy periodontal maintenance postscaling. Today, polishing by different methods is available to a clinician. Traditional bristle brush and rubber-cup polishing are being widely practiced and gradually getting replaced by novel air polisher. Pros and cons of each method should be weighed before its clinical applications. Aim and Objectives: To evaluate and compare the efficiency of three different polishing systems on enamel as well as on cementum surfaces by scanning electron microscope (SEM). Materials and Methods: A total of 120 samples were divided into three groups randomly – Group 1 (bristle brush), Group 2 (rubber cup), and Group 3 (air polisher) – with 20 samples each of enamel and cementum, which were subdivided into 10 control and 10 test group (subjected to polishing). The samples were analyzed by SEM at ×1000 magnification, and the data obtained were compiled and subjected to statistical analysis. Results: Polishing with bristle brush demonstrated less surface roughness and debris when compared to air polisher at P = 0.58, P = 0.03 for enamel surface and P = 0.003, P = 0.21 for cementum, respectively. The surface roughness was reduced considerably by rubber cup at P = 0.03 for enamel and P = 0.003 for cementum, compared to air polisher at P = 0.99 and P = 0.21 for enamel and cementum, respectively. Conclusion: The results indicate that polishing with rubber cup was more effective and statistically significant when compared to bristle brush polishing and air polisher for the crown and root surface smoothening and debris removal. Background: Periostin acts as a necessary protein for tissue integrity and maturity and has a key role as a modulator of periodontal ligament hemostasis. It has been shown that periostin acts as a supportive protein. The aim of this study was to compare the concentration of periostin in the saliva of patients with chronic periodontitis and healthy controls. Materials and Methods: In this case–control, cross-sectional study, a total of 45 individuals (25 patients with chronic periodontitis and 20 healthy controls) were evaluated. Whole saliva samples were collected, and periostin levels were evaluated by standard enzyme-linked immunosorbent assay. The results were analyzed by SPSS and Mann–Whitney analysis. Results: The results of this study showed that the level of periostin in saliva in patients with periodontitis was significantly lower than healthy controls (P < 0.05). Periostin was detectable in all samples. Conclusion: The results show that there is a significant relationship between the level of periostin in saliva and chronic periodontitis. Periostin may be considered as an inflammatory marker in periodontal disease. However, further studies are needed to confirm this finding. Background: In India, Ayurveda is considered to be more effective and cheaper than modern medicine. Ayurvedic literature shows its use in treating oral diseases also. However, their effectiveness, in comparison with the allopathic mode of management, has not been assessed previously. 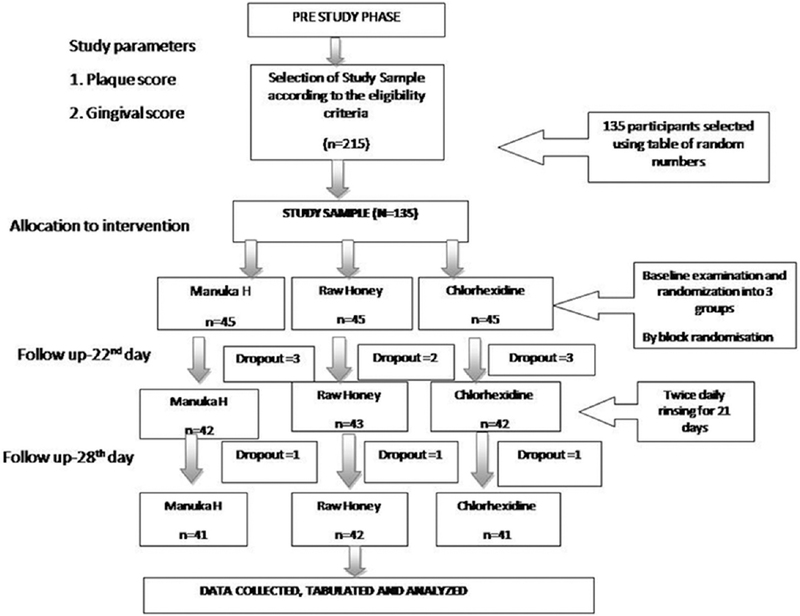 The aim of this randomized controlled clinical trial was to compare the efficacy of ayurvedic drugs over chlorhexidine in treating chronic periodontitis. Materials and Methods: Four hundred and eight participants, in the age group 20–49 years, suffering from mild-to-moderate chronic periodontitis were included in this study. Community periodontal index for treatment needs (CPITN) score was recorded, and oral prophylaxis was done for each patient. They were then randomly divided into 6 groups: control group (I), chlorhexidine (II), Khadiradi vati (III), Dashansanskar churana (IV), Neem (V), and Apamarga (VI); based on the drugs used by patients for the maintenance of oral hygiene after oral prophylaxis. Patients were recalled at 1 week, 1 month, and 3 months after oral prophylaxis. CPITN score was re-recorded for each patient at each follow-up. Reduction in CPITN score indicated improvement in the periodontal health. Observations were statistically analyzed using univariate ANOVA and P value was set at <0.5. Results: Improvement in CPITN scores in 6 groups was as follows: I – 42.0%, II – 76.37%, III – 82.03%, IV – 83.46%, V – 78.8%, and VI – 29.9%. Higher mean percentage improvement was seen when patients used these drugs for 3 months as compared to 1 month. Conclusion: Dashansanskar churana and Khadiradi vati showed better results than chlorhexidine and were found to be superior in managing mild-to-moderate cases of chronic periodontitis. Objectives: The aim of this study is to compare the effectiveness of three types of mouthwashes manuka honey (MH), raw honey (RH), and chlorhexidine (CHX) on plaque and gingival scores of 12–15-year-old government school children. Study Design: This study was a double-blind, randomized controlled field trial conducted in Belagavi city, India. Materials and Methods: One hundred and thirty-five government school children aged 12–15 years were randomly selected and allocated into three groups, RH, MH, and CHX mouthwash groups. Ten milliliters each of honey-based mouthwash formulation and CHX mouthwashes (0.2%) were administered according to the group allocation twice daily for 21 days. All the children were examined at baseline, 22nd day (after discontinuation of mouthwash) and 28th day (1 week after discontinuation of mouthwash) for Gingival (Loe and silness 1963) and Plaque Index (Silness and Loe, 1964). Results: Descriptive statistics was applied for distribution of study participants according to age and gender. One-way ANOVA followed by Tukey's post hoc test and repeated measures ANOVA test followed by Bonferroni's post hoc were applied for inter- and intragroup comparison, respectively. Statistically significant reductions (P < 0.001) in plaque and gingival scores were observed in all the three types of mouthwash groups at the end of the 22nd day and 28th day. MH and RH mouthwash demonstrated equal effectiveness, whereas CHX mouthwash showed the maximum reduction in clinical parameters. Conclusion: Honey-based mouthwash showed a promising antimicrobial effect on dental caries and plaque and gingival scores. Background: The aim of the present study was to evaluate the gingival crevicular fluid (GCF) levels of YKL-40 acute phase protein in chronic periodontitis (CP) with and without type 2 diabetes and also to assess the effect of periodontal therapy (scaling and root planing [SRP]) on this GCF biomarker and the clinical parameters. YKL-40 is derived from tyrosine (Y), lysine (K), and leucine (L) with a molecular weight of 40 kDa. Materials and Methods: A total of 105 individuals (30–60 years) were grouped as 35 individuals each in three groups (Group I – healthy; Group II – CP with diabetes mellitus [DM]; and Group III – CP). Clinical parameters including plaque index, gingival index, probing pocket depth, and clinical attachment level followed by GCF sample collection from test sites were done at baseline and 6 weeks after SRP (among Group II and Group III patients). 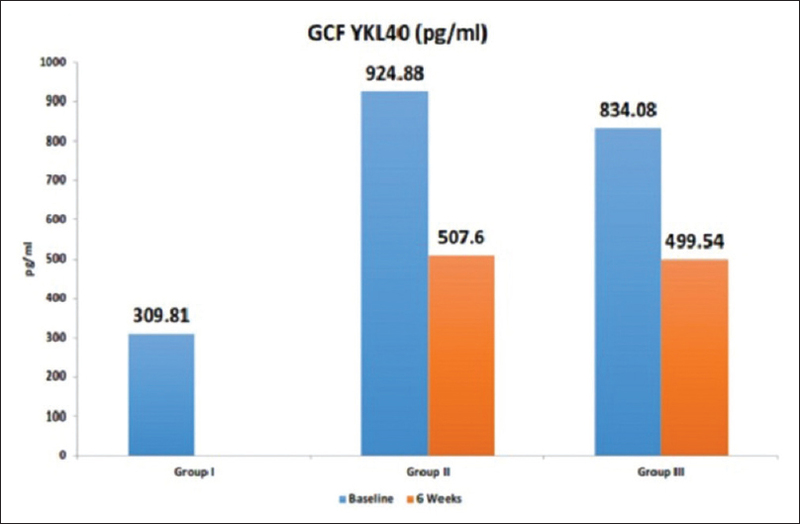 GCF YKL-40 level was determined by enzyme-linked immunosorbent assay. Results: The mean GCF YKL-40 level at baseline was significantly lower for Group I (309.81 ± 124.93 pg/ml) as compared to Group II (924.88 ± 415.28 pg/ml) and Group III (834.08 ± 270.42 pg/ml), respectively (P < 0.001). The level reduced significantly 6 weeks after SRP for Group II (507.6 ± 265.03 pg/ml) and Group III (499.54 ± 293.38 pg/ml) (P < 0.001). Conclusion: The level of GCF YKL-40 in CP patients with or without DM is higher than healthy individuals and the level reduced 6 weeks post-SRP among Group II and Group III. Hence, YKL-40 can be considered as an important biomarker in the diagnosis of CP. 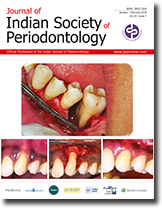 Aims: The aim of this study is to compare the outcome of coronally advanced flap (CAF) along with the use of platelet-rich fibrin (PRF) versus CAF in conjunction with a resin-modified glass-ionomer cement (RmGIC) for the management of Millers Class I and Class II gingival recession coupled with noncarious cervical lesions (NCCLs). 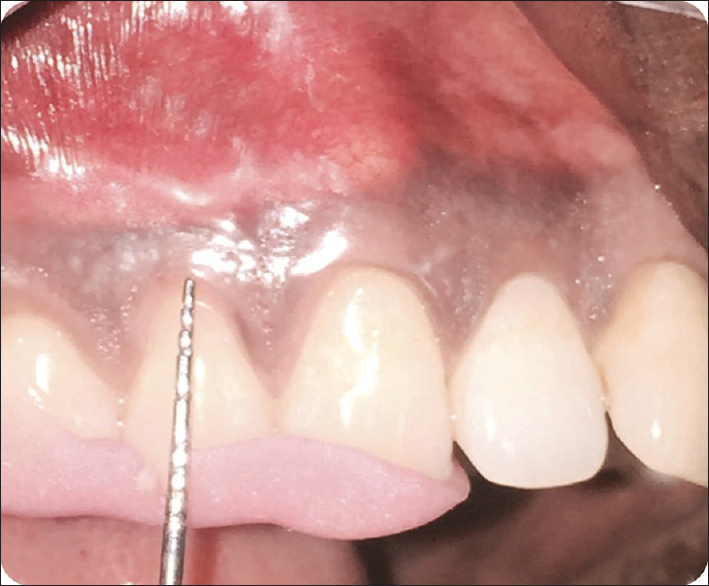 Materials and Methods: Single and multiple Miller's Class I and Class II gingival recessions were chosen for the study. Twenty participants with total of 78 sites associated with NCCL bilaterally in the anterior and premolar region of maxilla were selected. Thirty-nine sites were treated with CAF and PRF and the remaining 39 sites were treated with CAF and RmGIC. Clinical parameters such as probing pocket depth, relative gingival recession, relative clinical attachment level, NCCL height, NCCL width, width of keratinized tissue, and keratinized tissue thickness were measured at baseline, 90th, and 180th day in both the groups. The presence or absence of dentin sensitivity (DS) was determined at baseline and 180th day. Results: Both the groups showed optimal root coverage, with statistical significant difference in thickness of keratinized gingiva in Group I when compared to Group II from baseline to 90th day and from baseline to 180th day and also from 90th to 180th day. On comparing the DS between Group I and Group II from baseline to 180th day, Group II showed greater reduction in dentinal hypersensitivity as compared to Group I. Conclusion: The use of PRF along with CAF showed increased thickness of the keratinized tissue and the utilization of RmGIC resulted in decreased DS. Hence, the combination of CAF and PRF or CAF and RmGIC could provide a better treatment option in the management of gingival recession that is of esthetic concern. Background: Preeclampsia is identified as an important cause for mother and newborn mortality. Inspite of extensive research, the exact etiological relations have not been established. Hence, an attempt has been made in this study to evaluate the relationship between the preeclampsia and maternal periodontal disease. Materials and Methods: The case–control study comprised of thirty pregnant women distributed equally in the case (preeclampsia) and control (healthy) group. Gingival index, plaque index, bleeding on probing, clinical probing depth, and clinical attachment level were measured in both groups. Microbiologic examination for identification of one red complex organism Porphyromonas gingivalis and one orange complex organism Fusobacterium nucleatum were done in plaque and placental blood of cases and controls. The clinical examinations and collection of placental blood were done 24 h before delivery. Results: Periodontal condition in the preeclamptic women was statistically worse compared with the normotensive women. There was no statistically significant association between microorganisms in plaque and placental blood between normotensive control and preeclamptic pregnant women. The preeclamptic women had significantly higher chances of having newborns weighing <2.5 kg than the normotensive women. Conclusion: The preeclamptic women were associated with significantly higher periodontitis and lower fetal birth weight than normotensive women. Introduction: Very little is known about the hard to reach tribal communities in India and one such community is a primitive hidden and isolated tribe group of Bharia people in Patalkot. Their health problems need special attention as they have very limited access to health care. The aim of this study is to assess the oral hygiene and periodontal status in the primitive tribe group of Bharias in Patalkot, Madhya Pradesh, India. Materials and Methods: A descriptive cross-sectional study was undertaken with sample size of 462 patients. The sample was selected using simple random technique. A predefined pro forma was used to record information about oral hygiene practices and tobacco-related habits. Oral Hygiene Index-simplified (OHI-S), Community Periodontal Index (CPI), and loss of attachment (LOA) were used to assess oral hygiene and periodontal status, respectively. Results: The prevalence of periodontal disease based on CPI scores showed that 35.4 % had periodontal pocket > 6mm. It was also found that 27.9% people had attachment loss of 6-8mm. Mean Debris Index-simplified, Calculus Index-simplified, and OHI-S for the participants were 1.59 ± 0.73, 0.99 ± 0.70, and 2.56 ± 1.36, respectively. Poor oral hygiene status was found in 36.3% of Bharias. Conclusion: Higher prevalence of periodontal diseases and poor oral hygiene status in Bharia people can be attributed mainly to their difficult terrain, isolation, very low literacy level, socioeconomic status, and cultural practices. Kindler's syndrome is a rare vesiculobullous dermatological disorder sometimes involving multiple organs. First described by Kindler. The differential diagnosis includes Rothmund-Thomson syndrome and epidermolysis bullosa. Fisher's criteria have simplified the diagnosis with major and minor criteria. Oral manifestation of this syndrome includes multiple painful oral ulcers in the mucosa, periodontal attachment loss, gingival bleeding, and fragile mucosa. These manifestations may impair proper nutrition intake, may cause growth and development problems. 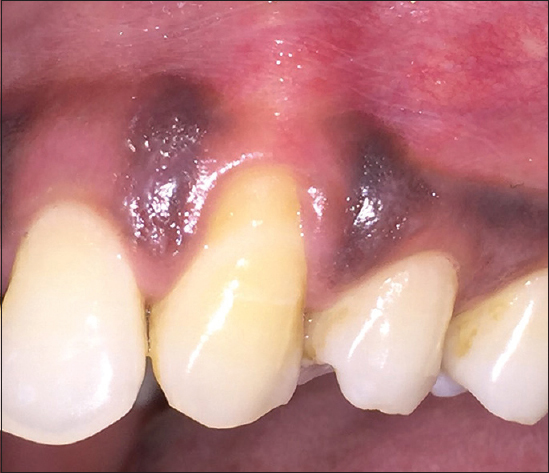 This case report deals with the management of oral and gingival manifestations in a 12-year-old female child patient diagnosed with Kindler's syndrome. Favorable esthetics is one of the most important treatment outcomes in dentistry, and to achieve this, interdisciplinary approaches are often required. Ridge deficiencies can be corrected for both, soft- and hard-tissue discrepancies. To overcome such defects, not only a variety of prosthetic options are at our disposal but also several periodontal plastic surgical techniques are available as well. Various techniques have been described and revised, over the year to correct ridge defects. For enhancing soft-tissue contours in the anterior region, the subepithelial connective tissue graft is the treatment of choice. A combination of alloplastic bone graft in adjunct to connective tissue graft optimizes ridge augmentation and minimizes defects. The present case report describes the use of vascular interpositional connective tissue graft in combination with alloplastic bone graft for correction of Seibert's Class III ridge deficiency followed by a fixed partial prosthesis to achieve a better esthetic outcome. Patients with periodontitis may have one or few teeth with hopeless prognosis, which would have to be extracted before initiation of orthodontic therapy. Periodontal therapy aims to prolong the lifespan of dentition, as preserving natural dentition is always the best treatment option. The decision to retain a tooth is always based on the probability of long-term success of one or more treatment modality. A 17-year-old female patient seeking fixed orthodontic treatment presented with the left mandibular first molar tooth (36) having hopeless periodontal prognosis with advanced primary periodontal and secondary endodontic lesion, grade III mobility, and grade II furcation involvement. Root canal treatment followed by periodontal surgery using a combination of bone graft (allograft) and platelet-rich fibrin membrane resulted in a clinical and radiographic indication of periodontal healing. The tooth (36) was even used for orthodontic anchorage 3-month postsurgically and was maintained for 2 years. Appropriate diagnosis and meticulous multidisciplinary treatment approach can lead to the restoration of health and function of the teeth with severe loss of attachment and bone loss and can even be used for orthodontic anchorage. 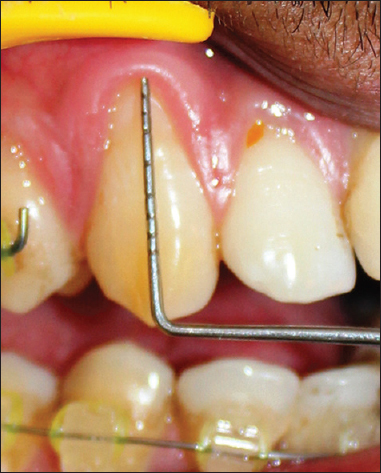 Several surgical techniques including pedicle flaps and free soft-tissue grafts have been indicated for the treatment of gingival recession defects with different success rates. Localized gingival recessions can be managed with various root coverage procedures, more specifically, using the coronally advanced flap with distinct designs. Predictable and consistent periodontal plastic surgical results can be achieved by using microsurgical instruments. Periodontal microsurgery involves the use of magnifying devices, microsurgical instruments, and materials in existing basic surgical techniques. It offers definitive advantages in terms of predictability, postoperative morbidity, and patient approval. This case report aims at comparing the modified approach with a triangular type of coronally advanced flap, using conventional and microsurgical approach, for treating bilateral isolated Miller's class I defect in both the maxillary canines by a split-mouth design. A patient undergoing orthodontic treatment presented with multiple recession defects in maxillary anterior region. After thorough clinical examination and assessment, measurements were recorded. Maxillary anterior teeth with recession defects of 3–4 mm were treated with coronally advanced flap and platelet-rich fibrin (PRF) membrane. Regular follow-up was maintained for the patient at 3, 6 , 12, 18, 24, 30, and 36 months. After 36 months, significant root coverage of 100 percent was observed in four defects and 50% coverage in one defect. 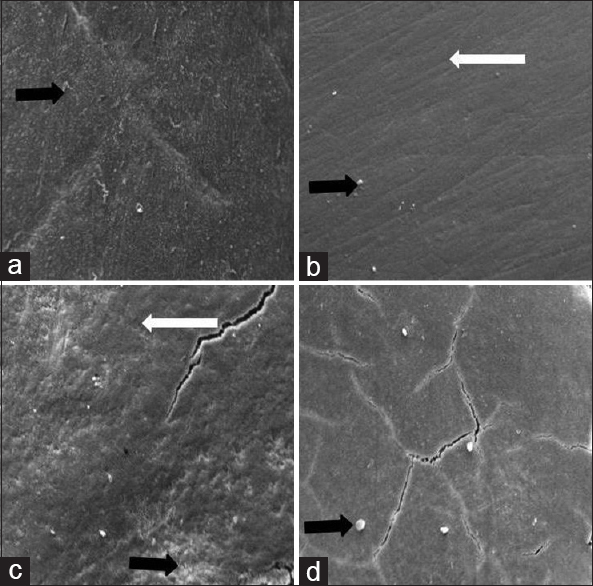 This shows that PRF membrane along with coronally advanced provides a predictable and significant result for management of recession defects.